I’m not an authority on all things Indigenous. I am only an authority on being one. Despite my great-grandfather, being an Indian signatory on Treaty 8, most of the information regarding our history with government oversight is new to me, as I expect it will be to most of you. What a shame this statement is. If you’ve ever read general media stories on Indigenous issues, coupled with what you likely learned in school, it wouldn’t be surprising if you have very light, usually unfavorable understanding, of First Nations peoples. Too often we’ve been portrayed as drains on society’s purse and guilt strings. The headlines, commentaries, and letters to Editors that I see daily certainly provide ample evidence of that. We’re at a place now where we can rise to counter the myths and we should. My son has been in our local school district’s Aboriginal Program since 1st grade and though his lessons have included more cultural detail and none of the talk about Indians terrorizing settlers that I’d learned, there’s wasn’t much beyond that except one disturbing lesson. It was only 3 yrs ago, within the general curriculum, that he was taught that Indigenous children forced into the infamous residential schools was a good thing because they were able to get an education. For the record, those notorious schools are not ancient history; the last of them closed in 1996. Apparently, those school lessons remain much the same for the general curriculum and Aboriginal program until graduation. There are no details added such as why the original Indian/Aboriginal/First Nations reserve system was created, what the rules were for living on them, and how they’re funded. This is mainly what’s behind the long-held misconceptions about what and why things are the way they are. I don’t think this is by mistake. I think we were all misled by early and some current governmental efforts to hide, subvert, and muddy the details of Indigenous history and issues in Canada. I think there was disinterest by most media who, given generous benefit of the doubt, were likely unaware of the full picture too. As more demands for governing transparency are made and more communications technology becomes available, we’re all learning far more, which benefits the Indigenous greatly by finally being heard in more vast and accessible ways. Government records are being posted online for all to review, including the many Indigenous peoples catching up in education. 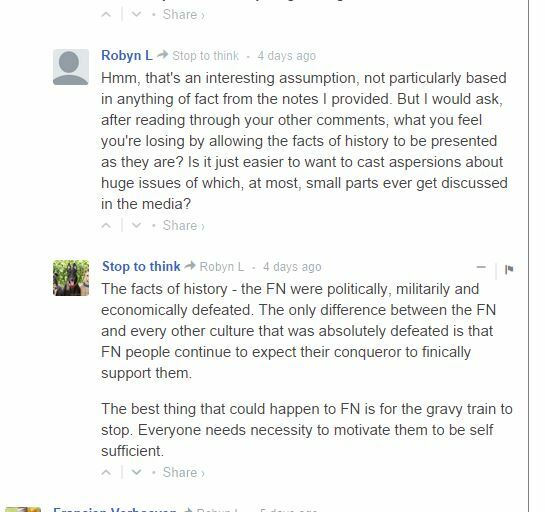 As mentioned in my previous post, some of my recent discussions about First Nations were rife with that lack of education and full of bitter assertions, derision and accusations against First Nations. When I contradicted their understandings, barrels of outrage erupted. The chats quickly devolved into calling me names and mentally unfit. 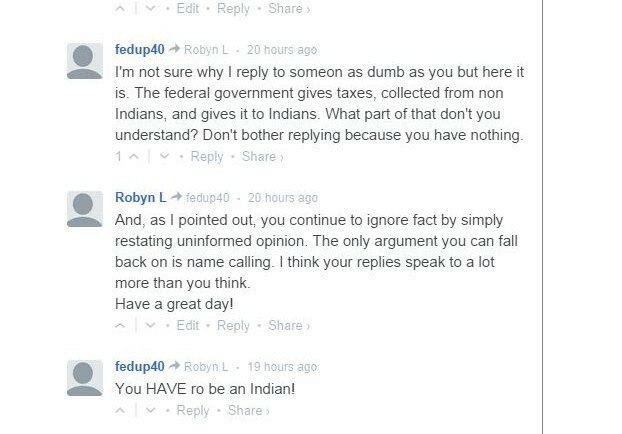 “Since when do First Nations people pay taxes”? We give you our taxes! The majority of First Nations people do, in fact, pay all taxes. Of the 1,400,700 Indigenous as of 2011, which includes registered and non-registered First Nations, Metis, Treaty, and Inuit, all are required to pay income tax and the same goods and services taxes as everyone else. Most of these people (+70%) do not live on reserves. The fewer numbers who live on reserves, and who can now earn income on reserve land, do get some income and goods and service tax exemptions, but not near the often assumed levels of ‘privilege’. As for those other often touted ‘free funds for Natives’, I’m a card carrying Metis and I have yet to find any funding to meet my medical needs or for continuing education outside of the same channels for everyone else. …“How do all the chiefs get away with taking millions while their band members freeze, with no clean water”? There are 3,000+ elected First Nations officials in Canada. They’re required to turn in over 160 to 200, financial reports per year to the department of Aboriginal Affairs and Northern Development Canada (AANDC, known as CIRNA effective 2018). Chiefs who misappropriate funds exist but number less than the annual mismanagement cases we find in the Senate. How are any bands able to consistently outwit the 4,000+ employee AANDC, when it is literally their job to read & approve the reports they demand of these bands? Assembly of First Nations Interim Chief, Ghislain Picard made a good point when he said, it’s too bad it’s these exceptions that are trumpeted and viewed as the norm instead of no outrage for the many more Chiefs who are grossly underpaid. Despite the heavy demands of the role, the average band Chief makes an average annual salary of $60,000 (updated in 2015 from a previous average of 36,000). Many are making far less than that, as low as $0.00 to $25,000 annually. They get no pensions nor entitlements as those provided for Prime Ministers, MPs, or Senators. “When will they finally stop living off of taxpayer’s backs and stand on their own two feet”? First Nations don’t live off of taxpayers, in fact, quite the opposite, their resources have generously subsidized Canada. Although, the 1876 Indian Act was used to brutally coerce government control of Indian economic and resource development and land use, Canada was formed through legal negotiations rather than war. Treaties were agreements meant to sustain Indigenous rights and uses of land and resources equally with European newcomers. They are not invalid ancient history documents; there have been several additions since, right up to the current Harper Government. The Indian Act outlawed First Nations from acting for their own economic development. This has only recently been somewhat revised and many reserves now generate their own monies in addition to the transfer funds they get from the ‘Indian Trust Fund’ which is overseen by Aboriginal Affairs and Northern Development Canada, (AANDC). They’re often referred to as ‘federal funds’, but that term should really be, ‘federally managed Indigenous funds’. The monies that were/are supplied to this trust fund came from part of the resources taken off of their lands. Note to people who insist it was started with taxes: the Bank of Canada and the taxation system didn’t even exist at that time. This fund is substantial, billions of dollars, and the Government of Canada still decides how those funds will be distributed to the bands. The country of Canada, when unable to manage with the rest of the resources from land and taxes, has actually lived off of that First Nations trust fund from time to time, paying for things like general Canadian infrastructure and economic stimulus plans. …”the monies due the First Nations peoples from natural resources has been taken into consideration as part of First Nation revenues”. … “the First Nations Trust Fund isn’t the only money that belongs to First Nations peoples that is handled by the AANDC”. She’s referring to the fees for the licenses, permits and other instruments to individuals and organizations for exploration and development on First Nations land, and the Indian Moneys Suspense Accounts under the direction of the AANDC. 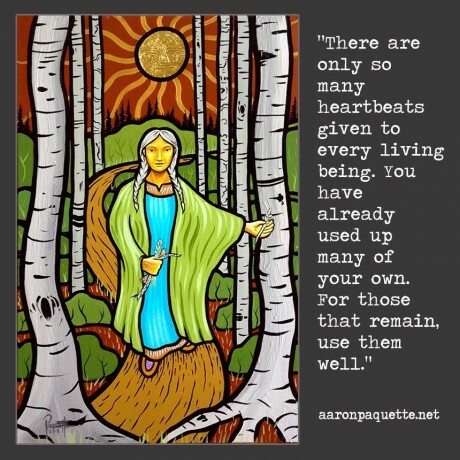 …”If the resource exploration and development projects weren’t on First Nations property, there wouldn’t be any need for AANDC to involve itself ergo the revenues generated from “licenses, permits and other instruments to individuals and organizations” is First Nations revenues, is it not”? “In other words, there’s all kinds of money that belongs to First Nations peoples that isn’t part of the First Nations Trust Fund, (and yet) the AANDC controls all of it”. So where have all those extra funds been going? Could it be, that Canada is in debt to the First Nations Trust Fund? 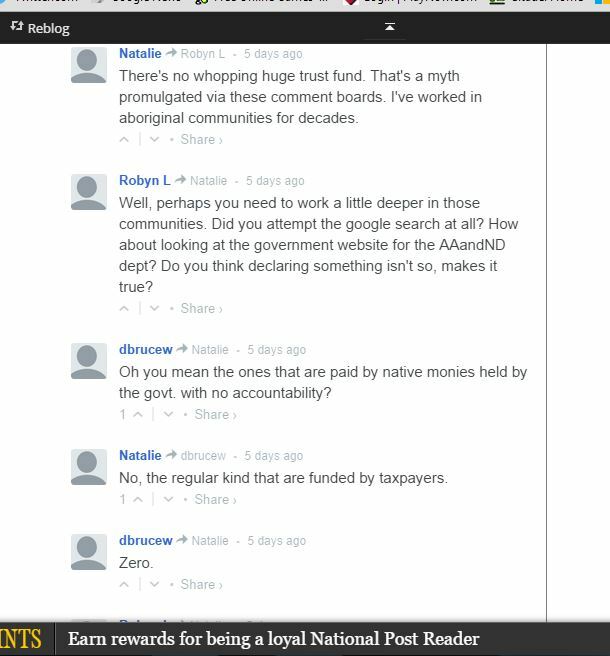 First Nations have been asking for transparency of that account for years. They’ve also been asking for autonomy in administration of their funds, education, and social services; however this has not been a successful effort. This was very nearly accomplished with an agreement set to be signed in 2007, called the Kelowna Accord. It was cancelled by the then next incoming Prime Minister, Stephen Harper. “Anyone crying that FN’s should disappear from the world and assimilate, might as well be advocating for Canada itself to be dissolved because that is the only way to dissolve the treaties. Like it or not, dissolving Canada puts us directly under international law. Like it or not, under international law, you must prove right of discovery. Like it or not, right of discovery belongs to FNs and Inuit under international law, meaning the lands and resources would revert to FN’s and Inuit, which is worth a lot more. Like it or not, this is why even Harper’s government has entered into Treaty as well as using Inuit right of discovery to secure Canadian jurisdiction over the Arctic’s vast resources”. Most, if not all of this, should be common knowledge to the average Canadian citizen, after all it’s their history too. Given the speed with which we can share information now, I feel cautious optimism that most Canadians will finally understand the issues and the reasons behind them. These details are a huge missing piece of esteem building block for people of Indigenous ancestry. We don’t all have a full understanding of our own history. We deserve this. We deserve recognition for the stunning contributions of the Indigenous Peoples on behalf of Canada even while being purposely oppressed or denigrated for the consequences of that history. Surely, this is worthy of respect; it’s certainly worthy of placement in all school history books. Unfortunately, there will always be people who will continue to deny the worst of our history despite its evidence. There are citizens, leaders, and purveyors of history who say it’s time to just to move on. How do they propose successfully moving from point A to C, if we don’t acknowledge the hows and whys of point B? Knowledge changes everything. All of Canada benefits when her history is fully known. The scars of that history can heal only if they’re truly and fully acknowledged; the fears that hold that back, hold us all back. Those fears are based in the idea of losing something, but the facts show that there is only everything to gain. My boy – I will always hope that whatever your challenges are to be, you will always know that you are lovingly surrounded and supported by a thousand of your ancestors. You are a great spirit, with the wisdom of the eagle and the heart of a warrior. “Great spirits have always encountered violent opposition from mediocre minds.” -Albert Einstein. This entry was posted in Discrimination, First Nations, History, Indigenous Peoples, Life, WPLongform and tagged First Nations Funding, Indian Trust Fund Trillions, Metis, Native Americans, Residential Schools, taxes, taxpayers, Treaty Indian. Bookmark the permalink. Eye-opening Robyn. Well written and informative about topics that are, at best, not commonly public knowledge and at worst are deliberately hidden from the public.The revenues from FN owned land development had not even occurred to me.The fact that there are government controlled accounts with FN funds that are not only not declared or transparent but are, in fact, deliberately undisclosed, is mind blowing in this day and age. Also that so much of FN fundng is actually done with the interest off FN monies, is completely new to me. I had, like everyone else, heard all the financial mismanagement stories but had often wondered how that fit with the fact that many casinos in Eastern Canada are funded and run by FN and there has never been a peep about any mismanagement. That takes professional management and first class investment knowledge – and is apparently running smoothly. This puts lie to the common stories of ineffectiveness and incompetence.. This post makes it quite clear that if the relationship between the First Nations peoples and the Government is going to be fair and equitable and transparent – then the FN are going to have to make it that way because the gov’\t is going to hide as much as they can. That is a pretty damning realization because it points clearly to the lack of integrity and representation currently being displayed by the gov’t. Oh, what the hell, in all honesty our gov’t representatives have often been that way persoanlly so it’s no wonder that the organization is that way as well. Thank you so much for this Robyn. You have opened my eyes and this information will inform all my future thoughts regarding FN and their treatment. Pleaee continue to help the rest of us understand your peoples’ heritage and culture and relationship with the non-FN. Your style (both personal and written) is perfect for increasing the public awareness on these topics. Thank You. Thanks, Paul. I have to admit, as I was getting these lessons in reality (from some much smarter & knowledgable people than me), I was somewhat stunned. I still am. When I realized there was so much obfuscation by governments and even their friendly newspapers for so many years, I think you might have heard me scream from the coast. Not too long ago I read an Op-Ed here, that was printed in three papers about how First Nations were demanding that full disclosure of our history be taught in schools. The headline read: Is it aboriginal education or just victim studies? This guy, a legislative reporter and columnist, had the nerve to quote a journal passage from one of the British colonizers of 1800 something as proof as to why the Indigenous were better off with the ‘saving efforts of the English’. The biggest point they seemed to have missed, was that no one seemed to mind the decades of teaching everyone,including the Indigenous, that the Indigenous were murderous savages and simpletons, . And this guy was still up for keeping those lessons going. Of course, I wrote in, but they wouldn’t print my countering reply. Very nicely crafted Robyn. A wealth of information. Thanks very much, Mike. My head still spins, actually. Now, the real work to get this into the same books that took away so much of my own, and countless other’s self esteem. Thank you for summarizing all the misconceptions and setting the truth free! I hope many see this post as it is a great education ! Thanks! Thank you, Joanne. I only hope that the efforts to get the truth into schools, where it really belongs takes moments compared to how long the other lessons were in those books. So many people forget, how many, and for how long, those lessons were taught, without a thought to damaging young Indigenous minds. So many misconceptions on so many fronts. Thanks for writing about this one. I’ll share others during our next conversation. Thank you, Marian. From the bottom of the heart of a little girl who needlessly grew up ashamed. It’s like that movie Swordfish could’ve been about the AANDC not the CIA! Keep up the good work Robyn, I’m with Paul. I don’t even know how to start to reply to such a beautiful comment, Rachel. I have a few friends here who have kids with autism and they do vary on the spectrum, but mostly they are highly functioning, beautiful beings. They are lucky with the parents they have, who have invested so much as early as possible to move them forward in leaps. We’re all learners here on this planet, and luckily we have more people who embrace the process instead of fighting against it.